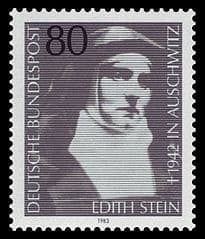 St Teresa Benedicta was born the youngest of eleven children into a Jewish family at Breslau, Germany. By her teenage years, she had become an atheist. A talented academic, St Teresa Benedicta studied at the University of Breslau and received a Doctorate from Gottingen University. She then became a Teaching Assistant at various Universities. Through her studies and readings, notably the autobiography of St Teresa of Avila, she converted to Catholicism and resigned her assistantship to teach in a Dominican convent school. During the following years she produced many writings including a translation of Thomas Aquinas’ “Of Truth” into German, She also wrote to Pope Pius XI denouncing the Nazi regime for its abuses in Christ’s name. In 1932, St Teresa Benedicta entered the Discalced Carmelite Order and was transferred to the Netherlands along with her sister (Rosa), who had likewise converted to Catholicism and joined the same Order. In 1942, they were both arrested, as Jewish converts, along with 987 other Jews and taken to Auschwitz concentration camp. They were executed in a mass gas chamber, possibly on the 9th August 1942. St Teresa Benedicta’s Feast Day is the 9th August. She is one of the six Patron Saints of Europe. Pray for us that we will continuously seek to discover the treasures Jesus has prepared for us.